Over time, we at Terry Ortynsky’s Royal Auto Group have set to achieve one overriding goal: to make it easy for you, the customer, in every possible way. We want to make it easy for you to find exactly the right vehicle. We want to make it easy for you to get through the paperwork as painlessly as possible. And we want to make it easy for you to recommend Royal Ford and Royal Honda unreservedly to your friends and family with the words, That was the best car-buying experience I’ve ever had! In his efforts to streamline the car-buying process, Terry has become an innovator in the car dealership industry. So much so that he’s been used as an example in best-selling management books. Terry’s approach is not empty slogans, but true management innovations. He has torn down the walls, literally, that slowed communication between different departments, such as parts, the show and the showroom. At the Royal Auto Group, parts specialists, mechanics and dealers all interact with each other easily and quickly. This eases and speeds up the process of buying, fixing and adjusting vehicles. Terry has also found a way to shorten paperwork by more than half- buying a car, a process that once took a painful 40 minutes, now takes a straightforward 10. At Royal Ford and Royal Honda, it is now easier and faster to secure financing and complete the transaction than ever before, And by hiring some of the nicest people in the business. Terry has created an environment that is so welcoming that customers return just to say hello, to have a cup of coffee, and to enjoy the warmth and energy of the dealership. Terry Ortynsky and his staff have made it easy to find and buy a car. When you are in the market to buy a new or pre-owned car, drop by our dealerships and see the dramatic difference in your buying experience. We proudly serve Yorkton and Parkland area, Langenburg, Melville, Regina, Esterhazy and Canora in Saskatchewan as well as our neighbours in Manitoba including Swan River, Russell, Roblin and Dauphin. This booklet is very different from any other you’ve ever read. In it, we are going to reveal some of the most manipulative sales techniques that can be used against you. We want you to be aware of what is going on when you are in the market to buy a new or used car or truck. Our goal is to help you get the vehicle you want at a fair price. Please read this over, and bring it with you when you are considering buying a car or truck, or for any other purchase, for that matter! Commissioned sales people have one goal in mind, and that is for you to pay as much as possible. Why? Because they have a vested interest given the more you pay, the more money they get personally. That motivation is in direct competition with your customer satisfaction. 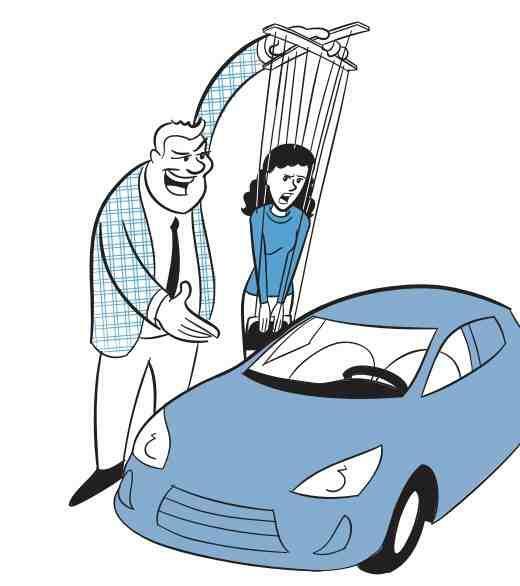 When Terry Ortynsky studied the structure of this “conflict-of-interest” he saw that if he was to accomplish the highest degree of customer satisfaction possible, he needed to end the system of commissioned sales in his dealerships. Many people in the industry warned him against that. But Terry went against the tide, and put all sales people on salary and took them off commission. This was a huge game changer! Now, the professional sales staff at Royal dealerships has only one mission, and that is to serve you, the customer. The sales associates at Royal do not have a conflict of interest between their personal gain if you pay too much or buy the wrong car or truck. They make the same amount of money if you buy from them or don’t! But they do have a job, and that is to help you get what you want. They will do everything they can to make sure that you end up with the perfect transportation at the right price. Also, the entire dealership is set up to make it as easy as possible for you to sail through the buying process, the paperwork, the financing, and all those little extras that make it a pleasure to buy from Royal. In the next few pages we are going to outline some of the most basic sales techniques so you will have a deeper understanding of what is going on, and will be better prepared to make your buying decisions based on what you truly want. Most sales techniques have one thing in common: CONTROL. They teach the sales person to gain control of the sales situation so the customer is directed to say yes, even if that person doesn’t want to buy. Most sales techniques, from “high” pressure to “soft” sell, presume that you, the customer, are not to be trusted to make your own decisions. Most of us have had bad experiences with the high-pressure version of this. It leaves a bad taste, whether or not we buy the product that is being offered. Often, customers buy what they want in spite of the manipulative sales technique that is being used. Why? Because the customer wants the product or service and would have purchased it regardless of the sales technique used. Controlling sales techniques harm relationships between the customer and the company. These techniques actually work against customer satisfaction, even if the client does say yes to the sale. From the sales perspective, this is a short-term strategy – get the sale right now – rather than thinking about the life-time value of the customer. In this technique, the idea is to get the customer into the habit of saying “yes.” So the sales person asks many questions that can only have a “yes” response. Silly as it sounds, too often, sales people attempt to use this technique as if the customer would say yes against his or her own good judgment. This is an easy technique to spot, and it might be fun to notice it the next time someone tries it on you. This technique tries to put pressure on you! The sales person gives you the feeling that the clock is running out on a good deal, and you need to make a decision now! Notice whenever the sales person is trying to force you to say “yes” because the situation will change and you will lose your best deal. Our advice is to walk away from such claims. Often, you will find that the sales person will call you back the next day, saying that they have managed to “keep the deal open” for another day. Another way to try to pressure you to buy now is to say that someone else is considering the same vehicle, so you’d better act now or you’ll lose the chance. Be aware of this claim. Often, there isn’t another person in the wings, except in the story that’s being told to force you into buying before you have a chance to think it through. Some companies advertise an unbelievable deal. If you call the company to ask if what was advertised is still available, you are told that it is, and that you should come right down. But, once you arrive, you are told that what was advertised was just sold, and there are no more left, however there are some deals that you might be interested in. Watch out for this “bait and switch” technique, because if the sales person is willing to lie to you, it is not a good basis of trust. One sales team was told that if a person calls wanting a pink car with blue and red polka dots, their answer was to say YES! When the person comes in, they were to say, “You just missed out. It was sold a few minutes before you came.” The point was to try to get the person into the store so the sales person could have a chance to manipulate the customer into a sale. game that is being played. In this technique, the sales person pretends that they are trying to get you the best deal, but they need to get the approval of their “sales manager.” Too often, there is no sales manager, but simply another sales person. However, even when there is a real sales manager, the sales person acts as if he or she is the middleman, going back and forth with offers that are first rejected, and finally accepted. The hope is that the customer thinks he or she has gotten a good deal, but what really has happened is the customer has paid more than the fair price. Have you ever witnessed the numbers game in action? The sales person writes an offer in large numbers. He or she knows that this is too high, and the customer will reject it. More numbers are written down the page – more offers that will be unacceptable. Each number is written smaller and smaller. When the end of the page is almost reached, the sales person writes a number that might be acceptable to the customer. There will be no more room to write other numbers. The idea behind this manipulative technique is that the customer will subconsciously assume there is no more room to negotiate. This is another way that sales people try to pressure the customer into a buying decision that may not be the best one. There are many closing techniques aimed at getting you, the customer, to say yes, even to a deal that is not very good. Often the trial close is connected with the Fake Sales Manager technique. But the customer has said yes in principle, so now a number of trial closes follow. Watch out for the fake closes! In this technique, the sales person tries to overwhelm the customer with more information than can be understood or is needed to be understood. The idea is for the sales person to pretend to be a technical expert, and have you think that you can’t figure all this technical stuff out. The hope of this technique is that the customer will relinquish his or her decision making process, and rely on the sales person to tell them what to do. This is how we see the relationship between you, the customer, and us, the dealer. We have an offer, which are our various vehicles and services. You are in the market to buy a vehicle and will need a variety of services, such as finance, delivery, maintenance, and so on. It is pretty simple: what is the match between what you want, and what we have? If we have a very close match, we have a basis of doing business together. If we don’t have a very good match, we don’t. Our job is to find out what you want. This might be as simple as asking you, and you telling us. But, often, it is not quite as simple as that. You might tell us you want a certain model. We want to know why you have come to that conclusion. Sometimes, people have decided what the best model might be for them, but, when we hear what they are really after, there might be an even better choice. We are glad to try to offer the customer what they want, and we want to make sure you have the very best chance in knowing what’s available. Our job includes consulting with you, getting really clear on what you want, understanding our inventory and how well it matches what you want. It also includes understanding the ways you make decisions so we can help you get what you want. We know our inventory, and, based on the various things you want, we may be able to make some very good suggestions. We do not try to position ourselves over you. We don’t need CONTROL in the sales situation. We are professionals who take pride in our job. understand what you want. That is the consulting aspect of our work. But we never want you to make a choice based on wrong information, manipulative techniques, or anything that is not great customer relationships and service. We want to do business with you now and in the future. We know the value of you being an Ortynsky customer for years. Our business strategy is simple: we want to do such a great job for you, that you will love doing business with us. No tricks! No techniques to use against you! We make the best match we can between what you want and what we can provide! We make it easy to do business with us! Thanks for reading this booklet, and we hope it helps you better understand your options when buying such an important thing as your next vehicle. We are here to help you in that important decision. Is this the vehicle you want? Have you checked the reviews on this type of vehicle? What is the fuel efficiency of the vehicle? Do you know the dealer? What is his reputation? Have you done your dealer review? Salesperson review? Are you comfortable with the buying experience? Is the cost within your budget? Have you checked financing options and interest rates? Have you inspected the vehicle? What is the odometer reading? Have you test-driven this vehicle? Are you satisfied? Are you familiar with the features and technology? What are the warranty options? Do you understand them? Do you understand the paperwork you are signing? Is there a return-vehicle policy? What is the reputation of the after-sale-service? Does the vehicle qualify for financing? What is the vehicle history? What is the service history? Was it involved in any accidents? Is there any warranty on this vehicle? If yes, what is the balance of the warranty? If no, is extended warranty available?